Walk to a Better World is an initiative created by extreme adventurer and anti-poverty advocate Matt Napier as a way of raising awareness of the need to do more to end extreme poverty. The Walk to a Better World campaign features the journeys and an online fundraising campaigns encouraging people to donate to organisations leading the way in overcoming poverty through sustainable development initiatives. In 2017 Matt walked 1850kms from the bottom of Namibia to the top, from the border of South Africa to the border of Angola. He kicked and/or carried a football the whole way and donated balls to schools throughout the journey. This walk raised over $40,000 which funded permaculture training in schools in Malawi through Empower Projects as well as water and sanitation projects in Zimbabwe through Caritas Australia. In 2016 Matt walked 2,296km across Southern Africa to raise awareness of global poverty and raise funds for his charity partners. During the walk Matt survived on US$1.50 per day for food to show how hard it is to survive on so little, one of the toughest things he has ever done. He also gave away 200 soccerballs to children at schools and community groups, the balls being donated by an amazing 12 year old Mac Millar. The journey raised $62,000 which funded four projects through Oxfam Australia, Caritas Australia, Care Australia and the Fred Hollows Foundation. 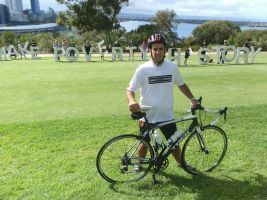 No stranger to long distance challenges, Matt has previously cycled across Australia (2012) and bounced an Aussie Rules football from Perth to Sydney (2013) as part of the Make Poverty History campaign. 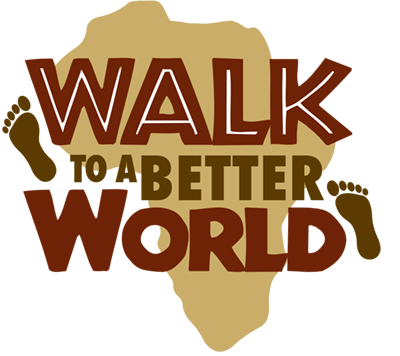 Walk to a Better World is an awareness raising campaign run by the charitable organisation Towards a Better World Ltd.
Matt Napier is an ordinary Australian who is passionate about seeing an end to extreme poverty and a fairer world for all. Over the last few years, he and his wife Wendy have dedicated themselves to raising awareness of global poverty. Matt has drawn much needed attention to the cause by undertaking extreme adventures such as cycling across Australia (2012), bouncing an Aussie Rules football from Perth to Sydney (2013) and walking across southern Africa (2016). In 2007, while visiting a friend Nepal, Matt saw the effects of extreme poverty up close for the first time. The sight of children begging for food and money on the streets with no prospects of an education affected him profoundly. On his way back to Australia, Matt began to question the contrast between the privileged lives of the majority of people living in the First World compared to those living in the Third World. He felt lucky but at the same time a little guilty to be returning to Australia. It seemed it was only an accident of birth that made the difference between his life in Australia and begging for money on the streets of Kathmandu. The first thing he had to do was get his own life in order. Before going to Nepal Matt had been suffering from depression, drinking too much, putting on weight and feeling that he was wasting the opportunities that he was privileged enough to have because of where he lived. So he focused on what was good in life, started excercising more and gave up drinking. He also met and married his amazing wife Wendy who shared his passion for helping others and giving back to those less fortunate. Together they built up a successful business in order to get ahead financially so they could eventually focus more of their time on raising awareness of global poverty. Matt wants to be a voice for the 1.3 billion people that live in extreme poverty around the world and in particular the 7.6 million children under the age of 5 who die every year from starvation and starvation related illnesses. These children are no different to children here in Australia, they have mothers, fathers, brothers, sisters, aunts and uncles who love them and want the best for them. Matt believes that it is our responsibility as global citizens to care about these children as if they were our own and wants to encourage all Australian’s to become part of the movement to end extreme poverty and give these children a chance at life, because they deserve it. So in 2012 Matt decided it was time to under take his first long distance adventure and cycled from Perth to Canberra (a distance of some 3800 kilometres) to raise awareness about Global poverty. His journey took six weeks and along the way he spoke scores of school children about the issue of poverty and how we can make a difference to make the world a better place for all. Little did he realize that this would just be the first of many adventures and the start of great things in terms of awarness raising and fundraising on behalf of the world’s poor. 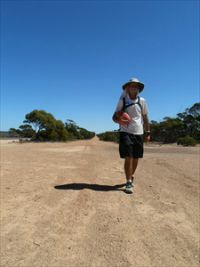 In 2013 wanting to continue to raise awareness, Matt decided to walk from Perth to Sydney whilst bouncing an AFL football the whole way. The walk started in the beginning of February and the 4,500km walk took 5 months to complete. He walked in temperatures ranging from 45 degrees right down to minus 8. During the walk Matt went through 6 footballs and 5 pairs of shoes. He also found over 150 dollars in coin on the road. After the end of the cycle Matt and Wendy visited Africa to see first hand the issues being faced by those in poor communities. They visited orphanages, schools for the disabled and volunteered on a project to build a community centre in rural Malawi. When they returned they were keen to start fundraising to be able to help more people and started running Charity Garages Sales from their home in Canberra. Then in 2016 Matt started to get itchy feet again and decided it was time to tackle Africa so he decided to walk across Southern Africa from Namibia to Mozambique – a distance of some 2,250 kilometres. During the journey he lived on less than $1.50 a day for food, to highlight the fact that 1.3 billion people live under the poverty line, loosing 15 kgs with 8 of those being in the first 10 days. This time he traded in his Australian Rules Football for a Football of the round variety. ‘Football is a sport that brings people together from all walks of life,’ he explains. ‘I follow Adelaide United in the A-League and have a soft spot for perennial West Ham United in the English Premier League’. During all Matt’s journeys he raises much needed funds for his Charity Partners and encourages people to take the pledge to give one percent of their incomes to organisations that combat global poverty. Matt and his wife Wendy, who accompanies him on these journeys as his support crew, have recently established their own charity Towards a Better World to bring all their charity ventures under the one banner. They continue hold regular Charity Garage Sales with all funds donated to sustainable development projects to help the most disadvantaged break the poverty cycle.